residual pressure still continues to act until 0.00826 second and imparts an additional free bolt velocity of 7.5 feet per second. (Cf. fig. 3-24.) This increase is shown by the curve designated as step 1 in fig. 3-33. 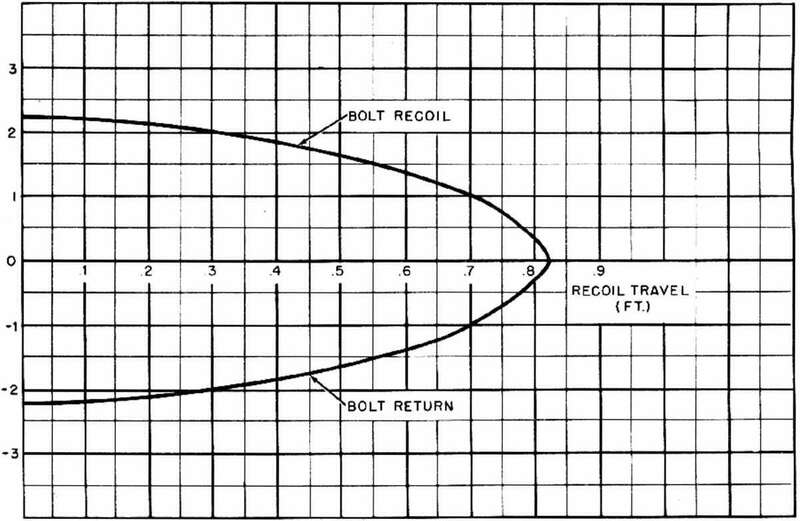 Note that after the residual pressure has decreased to zero, the free recoil curve is a hori-zontal line, indicating that the bolt tends to continue moving of its own momentum at the maximum velocity of 62.5 feet per second. That is. the effect of the initial compression causes the bolt velocity to decrease at the rate of 177 feet per sccond. This loss is shown in fig. 3-32 by the curve designated as step 2 for the bolt. To determine the effect of the spring constants, allowance must be made for the time that the bolt is moving. The force exerted on the bolt and gun by the driving spring will therefore depend on the relative movement between the bolt and gun. The first step is to use the curves designated as step 2 to obtain a first approximation of the gun and bolt travels (curves designated as step 3 in fig. 3-32). 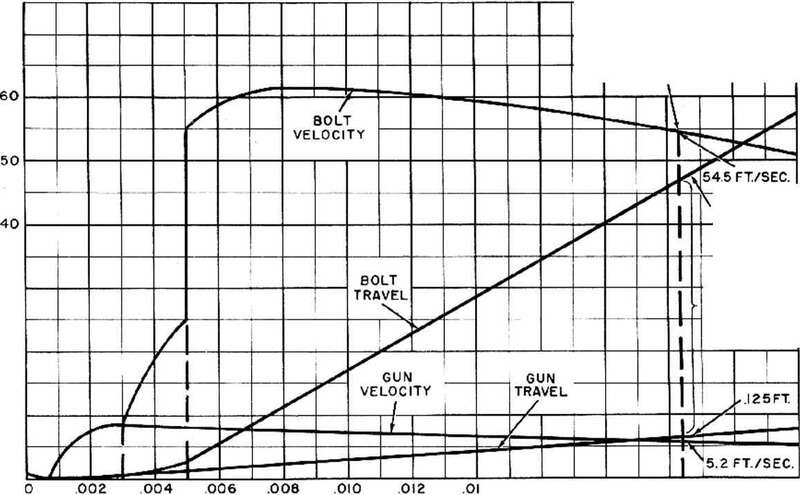 The first approximation of the relative motion between the gun and bolt is obtained by subtracting the gun travel curve of step 3 from the bolt travel curve of step 3.